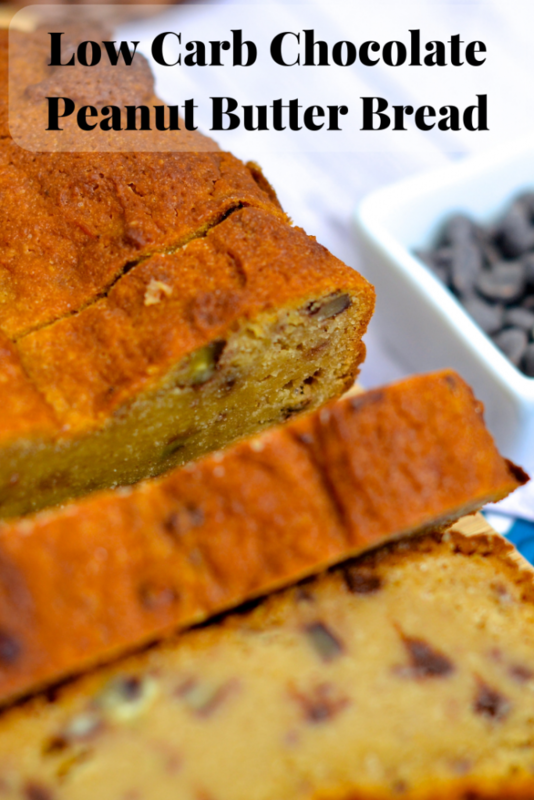 No one will guess this peanut butter bread is low carb! 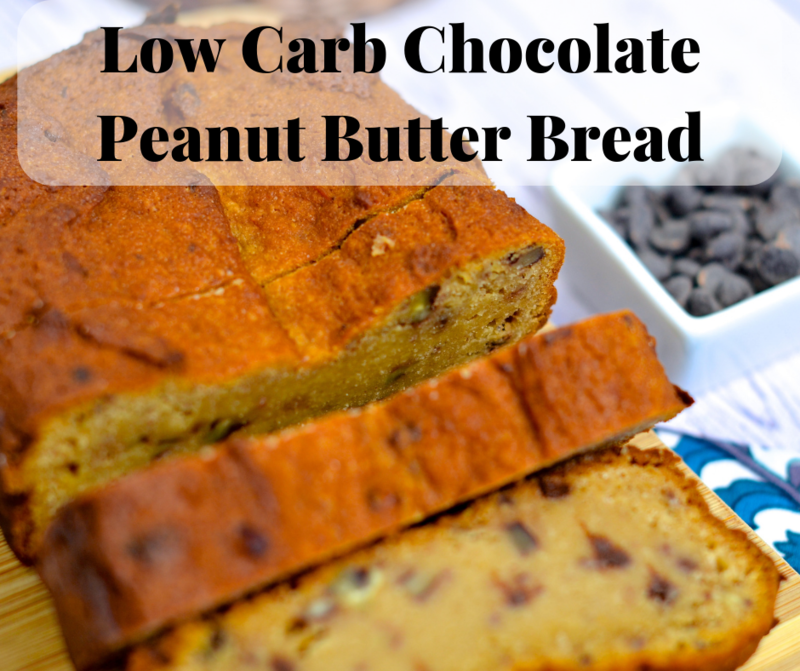 Only 7 pantry friendly ingredients and 1 bowl needed to make this amazing low carb bread! QUESTION TIME: Who loves peanut butter? Peanut butter is the ultimate, classic food. Kids love it as peanut butter and jelly (mine love it with marshmallow cream thanks to Mr Skinny Louisiana) and adults love it since it is a quick and easy, non-refrigerator lunch, snack, and supper! Growing up, peanut butter played more of a role in desserts (surprisingly, I am not a huge fan of peanut butter). That is correct, I didn’t enjoy peanut butter sandwiches, but I DID enjoy peanut butter in my desserts – fudge, cake, rolls, donuts, you name it, I loved peanut butter in a dessert recipe. It’s time to bring the love of a peanut butter sandwich into a dessert. No fudge, no cheesecake, just a peanut butter bread. Flour. Flour is needed in any bread/dessert recipe, so I had to switch over to almond flour. This really isn’t a huge problem since almond flour is delicious! Sugar. All our desserts need sugar, so a sugar substitute is needed. Peanut Butter. Yes, this love has some sugar – off to find a lower sugar variety. Using a few basic ingredients and simple ingredient swaps, I was ready to throw this dish in the oven. 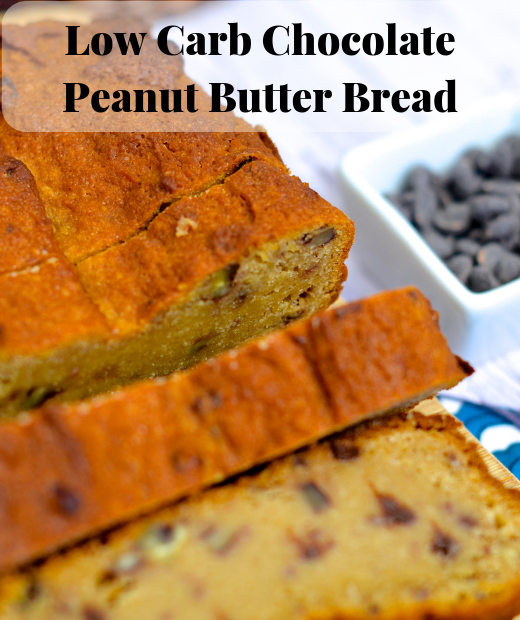 At around 30 minutes, my entire kitchen smelled of a bakery and after an hour, the gorgeous product was on display with eyes staring back at me with the look ‘cut the bread!’ The final result is a low carb peanut butter bread the entire family will love! Before I go over ingredients, know the items used in this recipe can be found at many of your local supermarkets and Drug Emporium. Many of you know my love of Drug Emporium stores. Not only does Drug Emporium have amazing prices (often the cheapest in town), I work with this amazing company in putting on Low Carb Food Demonstrations and product selection for shelves. All my items in the recipes are from Drug Emporium. For a full list of Drug Emporium store locations, click here. No Drug Emporium in your town? No worries, I have the links for where to purchase online! With any dessert, flour is the basic ingredient. It serves several purposes, mainly as a thickening agent and to hold the wet ingredients together. Flour in the low carb and low net carb world makes us cringe since whole wheat flour has 21 grams of carbs and 3 grams of fiber per 1/4 cup serving. Enter almond flour! Almond flour is made of almonds that have been ground to a fine texture. It is a gluten-free, keto-friendly, grain-free food and contains approximately 5-6 grams of carbs per 1/4 cup. Don’t panic over the carbs, almond flour has approximately 3 grams of fiber giving this flour a net carb of 3 per serving. Finally, don’t panic over the fat. Remember nuts are the fats we want to include in our diet. 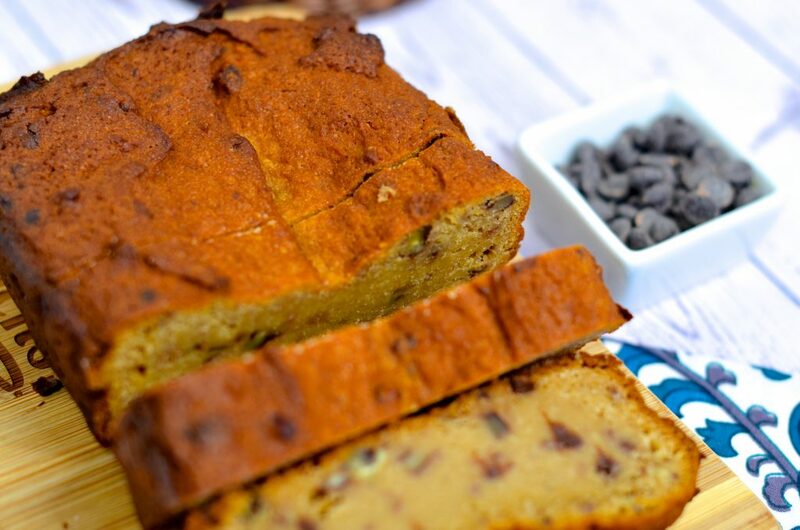 I do enjoy cooking with almond flour, but I personally feel due to it’s heavier texture, almond flour works best in bars, brownies, and muffins as well as in my batters for my vegetables and meats in the air-fryer. The type of almond flour does matter. Make sure to use super-fine almond flour from balanced almonds. 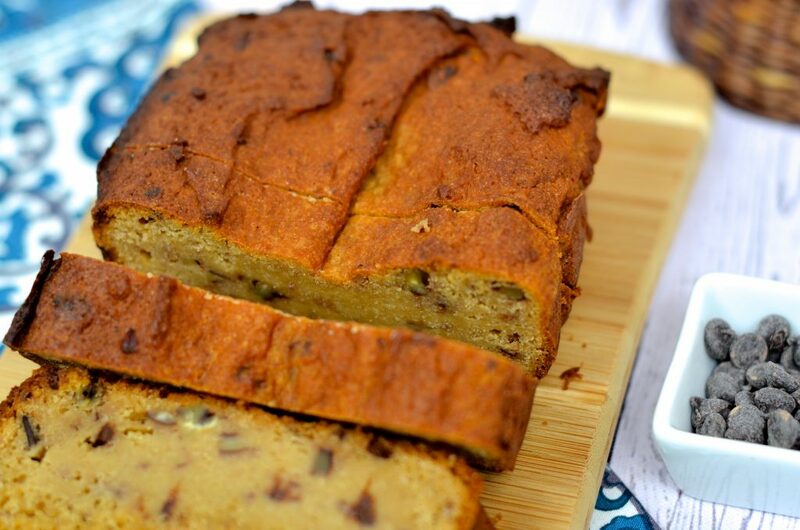 We used Bob’s Mill Almond Flour in this recipe. You can purchase online here! Not all peanut butters are equal! While many of us love peanut butter as a snack, we have to be very careful in the type we select. Many of our peanut butters have added sugars (think of those fun flavors we see at the store). Take a look at the label and compare looking for a product with no added sugar. In no circumstance select low fat peanut butter, these usually have added sugars. For a keto friendly variety, use almond butter, but again, still double check those labels. Two of my favorite low carb peanut butter brands are Crazy Richard’s Peanut Butter and Smucker’s Natural. Sugar is used to add sweetness to our dessert recipes. While a spoonful of sugar may help the medicine go down, at 4 grams of carbs per teaspoon, a low carb sugar alternative is needed. One of my favorite sugar replacers is Swerve. Swerve is a keto friendly, diabetic friendly sugar replacer and taste amazing. Kick those old blue and pink packets good-bye and pick up this New Orleans product. In this recipe we used Swerve granular sugar replacer. Swerve granular is an amazing keto sugar replacer in baked goods, and is a non GMO sugar replacer. Personally, I love the fact Swerve is a 1:1 sugar replacer. For example, if your favorite dessert recipe calls for 1 cup of sugar, you would use 1 cup of Swerve granular sugar replacer. While my keto friends jump to using almond milk, I am a fan of Fairlife Milk. This ultra-filtrated, lactose free milk (many of my keto friends avoid the milk sugar or lactose) has half the carbs and sugar of milk PLUS additional protein. However, you are welcome to use unsweetened almond milk in this recipe. Xanthum gum is very popular in gluten free cooking because of its ability to thicken dishes and mimic the gluten in our flour. It is formed with the fermentation of glucose and a bacteria found in cabbage. 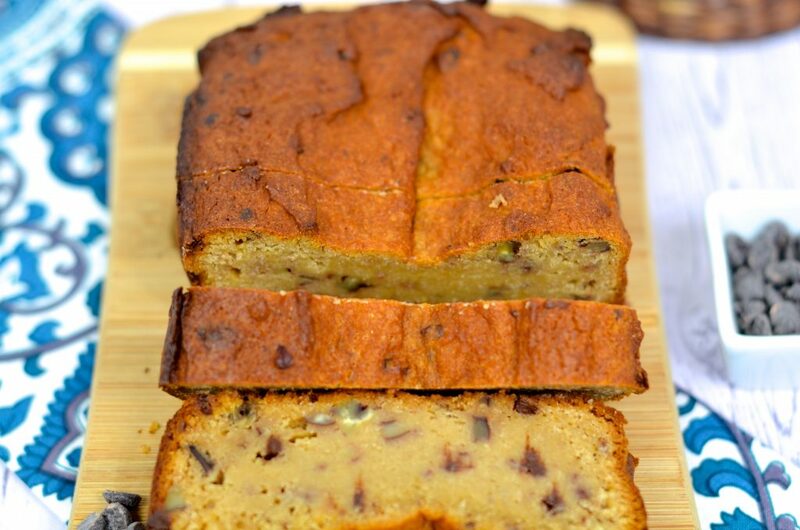 It is traditionally added to various desserts using almond and coconut flour to prevent the product from falling apart. Xanthum gum has a high fiber count, leading to a ZERO net carb product! We used Bob’s Red Mill Xanthum Gum. This no sugar added chocolate chip is gluten free, non GMO, and uses Stevia! Line a 9 x 5 loaf pan with non stick aluminum foil or parchment paper. The supplies needed for this recipe are super simple (can we say not a lot of dish washing!) – a large bowl, spatula, dry and liquid measuring cups, and hand mixer. In your large bowl, combine your dry ingredients (except the Xanthum gum). Push dry ingredients to the side of the bowl and add the liquid ingredients. Combine all ingredients until mixed. Beat for 2 minutes. Stir in Lily’s Chocolate Chips and walnuts. I choose to use Xanthum gum in my baking recipes since I do not want my bread to fall apart. Xanthum gum is completely optional for use. Let the OVEN do its MAGIC. Pour the entire mixture into a loaf pan. Cover loosely with aluminum foil. Bake for 45 minutes. Remove aluminum foil. Bake for an additional 15 minutes. Do note, the top may crack. Preheat oven to 350 degrees. Line a 9 x 5 loaf pan with non-stick aluminum foil or parchment paper. In a large bowl, combine almond flour, Swerve, salt, and baking powder. Slowly add peanut butter, egg, and Fairlife milk. Using a spatula, combine all ingredients. Using a hand mixer, beat on low speed for 2 minutes. Sprinkle Xanthum gum to mixture. Beat on low speed for 1 minute. Stir in Lily’s Chocolate Chips and walnuts (this step is optional). Pour mixture into loaf pan. Cover loosely with aluminum foil. Bake for 45 minutes. Remove aluminum foil. Bake for an additional 15 minutes. Nutrition Facts per Serving (done without walnuts): Calories: 190, Fat: 16g, Cholesterol: 15mg, Sodium: 100mg, Carbs: 6g, Fiber: 3g, Sugar: 2g, Protein: 8g.